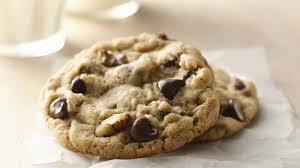 Did you know that the average American will eat 35,000 cookies in their lifetime and that Chip Ahoy! Is ranked number one in store bought cookies? I'm not surprised that a chocolate chip cookie ranked number one since chocolate chip cookies have been around since 1930 when Ruth Wakefield baked her first Tool House cookie. Ruth and her husband owned the Toll House Inn, so named because the structure, built in 1790, served as the toll house between Boston and New Bedford. Toll house were where travelers paid their tolls, rested or changed their horses and got a home cooked meal. In the tradition of the earlier toll house, Ruth cooked and baked for her guests. One day, while making Butter Drop Do cookies, a recipe that dates back to Colonial days, Ruth decided to cut up a bar of Nestles semi sweet chocolate into little bits and add it to her cookie dough. The chocolate did not melt like she thought it would. It only softened and held its shape. The cookie was a huge success and her recipe was published in the Boston paper. Ruth was approached by Nestles and they eventually came to an agreement. The company could print the recipe on the wrapper for their bars and Ruth would be supplied with chocolate for the rest of her life! Samoas, Trefoils, Do-si-dos and Thin mints If you recognize these cookies, you've provably bought a package or two from a Girl Scout. The first Girl Scout cookies were baked at home with moms volunteering as technical advisers. It was a way for the Mistletoe Troop of Muskogee, OK to finance troop activities. Being true entrepreneurs, the troop sold their home baked cookies in the school cafeteria. That 1917 troop project went national and today the Girl Scouts sell about 200 million boxes of cookies a year. Amazing what a couple of million girls can accomplish. Oreos (ranked #8) used to be my favorite cookie until I tasted Brent and Sam's Triple Chocolate Bliss. Okay, so it's not “technically” a store bought cookies but you can buy them on Amazon and we used them and other Brent and Sam varieties in many of our gift baskets. What is your favorite store bought cookie and which Girl Scout cookie do you buy and keep for yourself? P.S. You can see lots of our gift basket designs by visiting the Laurel Mountain Basket Co website.